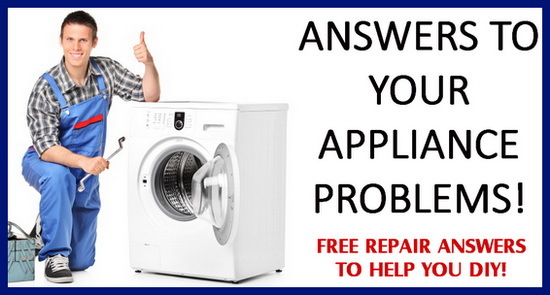 Answers to all your Appliance Repair needs. Find the answers you need below to help you to fix your appliance yourself! Is there an answer on here to help me with a Samsung washer that will not spin or drain? Having huge problems with this! Anyone have answers? I had the same problem with my Samsung front load washer and I replaced the Stator Assembly….. If your Samsung washer won’t spin the stator assembly at the back of the washer tub might be bad or damaged. The rotor is essentially one half of a motor, it interacts with the tub by creating a strong electromagnet. If the rotor fails or is damaged the washer might not spin or agitate. Check the rotor for damaged magnets or other defects. If your Samsung washer won’t spin the rotor assembly at the back of the washer tub might be bad or damaged. The rotor is essentially one half of a motor, it interacts with the tub by creating a strong electromagnet. If the rotor fails or is damaged the washer might not spin or agitate. Check the rotor for damaged magnets or other defects. I have a Samsung front loading washer. It fills with water, drum turns to redistribute/wash, stops and will not spin or drain. At this point I’ve replaced the drain pump, control board, and door switch. NO luck. Could it be that I just need to do the master reset??? Just learned of this function today. If you have replaced all of the parts you have stated above, sounds like your pressure switch is faulty. Take top off washer and find the rubber hose coming from the bottom of the washer. Disconnect the hose from the switch. Grab the end of the tube and blow air into it. Sometimes this hose can become blocked. Make sure the hose is not clogged. Do the same to the receiving end on the switch itself. You should be able to hear a diaphragm pop in and out and if not the switch may be bad. If not the switch should be removed and replaced. Can I put a W10179847 on a wfe510s0ab electric range? I cracked the ceramic counter-top on my range, and I know they’re not the original parts. But I’m cash strapped and found this replacement for cheap. What are the differences of the 2? Is one OEM and the other is made for it but not OEM? I have a Samsung dish washer that is making a very loud noise when it is running. I already took it apart and cleaned out the debris that was under the pump husing and impeller and it is still noisy after reassembly. Any thoughts on what it could be? Have you made sure the dishwasher is put back together correctly? Have you run the dishwasher empty to be sure it is not a dish or pot hitting the spray arm? What model # is your Samsung Dishwasher? I have a Samsung front loader washer WF330ANW. It will drain but won’t spin. When turned on, the machine will make some noise of a switch snapping and then the drum will vibrate but not spin. I don’t see any error code either. Any help will be very appreciated. Amana belt drive top load washer. agitates fine, when enters spin cycle motor turns but belt does not. If I open the lid and move the tub a bit, it will become unstuck and spin fine. My Whirlpool Cabrio dryer stopped working completely. This happened 3 months ago, paid a repairman $120 to come fix it. All he had to do was remove a section of the dryer’s exterior shell and vaccum out impacted lint. We clean the filter after each load, but lint somehow gets packed into the interior working area. How do I open the exterior covering of the dryer in order to vacumm out the lint? Thank you! I have a Samsung HE Top Loader. Something must have gotten inside one of the loads and it punctured the tub inside because it was leaking. However the washer still worked ok just leaked. It was not too concerning to me because I have a cement basement floor with a drain and the water just ran down the basement drain. However the other day the washer stopped working after it filled up. I went downstairs to get the load out and the washer was filled with water and would/t do anything. I unplugged the washer let it sit and plugged it back in still nothing. All the lights will come on-it plays the start up note when you turn it on and acts like ti is washing but nothing is happening inside. I even tried just the spin cycle. Could the fact that the tub had a hole in it have done something to damage it else or could this be related to something else. Thanks. My Samsung model# wf218anw/xaa front-loading washer will not spin the water out of the tub when I put clothes in it! It will spin if the washer is empty! I can do the steps to reset and it does, but it will not spin the clothes! If the washer spins but will not get the water out, check the front drain filter to be sure it is not clogged. Clean it out. If the washer still will not drain, you will have to get to the drain pump and find the issue with why it will not drain. Also, check the drain hose at the back of your washer to be sure it is not crimped or bent. My washer restarts itself after the cycle is complete. How do I fix this problem is there some sort of code to stop it from doing this? My frigidaire top loading washing machine wont stop adding water during the spin cycle. The machine goes through the wash and rinse cycle, but once it gets to the spin cycle it starts spinning but adds water at the same time. I end up with soaking wet clothes and a pool of water at the bottom of the machine!! Please help!! Maytag (Atlantis) top loader makes humming sound (like jammed motor) but will not agitate, drain or spin…please; any suggestions? Thanks much! I have a LG washing machine, the water flow is slow, and it looks like it’s not enough water in the tub. I have a Samsung Front Load Silver care model WF306LAW/XAA washing machine. I was getting a ND code so we checked the drain pump and hoses and all are clear. I thought the drain pump was making more noise than I had ever noticed, but we went to the next step and replaced the door switch and still no luck. Washer will not spin with laundry in the washer, but will drain and spin with no laundry in washer. What does the rotor and stater do for this machine? Can it be this or maybe do I need a new drain pump. The washer is 10 years old and don’t want to buy a lot of parts before coming to the conclusion I just need a new washer. Have priced a rotor and is around $280/$290 and have already spent $100 on door switch and the drain pump is around $75.